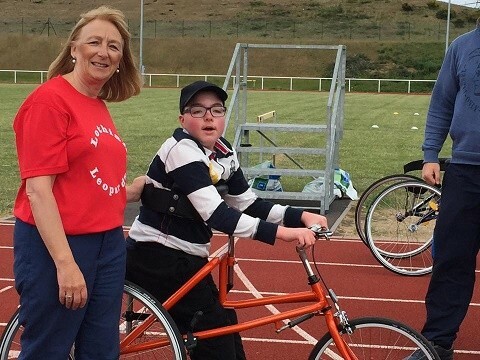 Lothian Leopards Disability Athletics Club (LLDAC) were delighted to host the 'launch day' for their new running bikes on Saturday 20th June at club's home, Meadowmill. 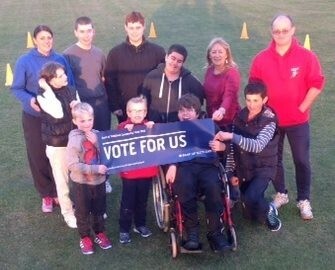 LLDAC Head Coach Jean Dobson has worked closely with Lothian Disability Sport over the past 12 months and were lucky enough to secure funding from the Bank of Scotland Community fund, enabling the club to purchase two running bikes and provide another opportunity for young people with a disability in the Lothian region. In addition, Enjoy Leisure have also supported the club's vision and also purchased two running bikes which will also be used by members during club sessions. The bikes will be the first across the East region of Scotland and proves to be a extremely significant development. The race running bike is a three wheeled cycle with no pedals which supports riders as they walk/run. They are designed for those with a disability that affect mobility, balance and co-ordination, such as cerebral palsy. The lightweight frame and low rolling resistance, little effort is required to propel the bike. The 'launch day' was supported by Enjoy Leisure, Lothian Disability Sport and East Lothian's Athletics Development Officer, Jamie Bowie. The day was also lucky to have coaches from the ACE Race Running Club in South Ayrshire attend - Peter and Margaret Drysdale using their considerable experience to provide some valuable input and information for coaches and athletes alike. In total, the day attracted 13 young people along - some who had experience of running bikes and some individuals trying the sport for the first time. We hope that these athletes will engage on a regular basis and strengthen the club and race running in the East as a whole. Lothian Leopards Disability Athletics Club and enjoyleisure are delighted to announce the arrival of four disability running bikes at the East Lothian Athletics Arena, at Meadowmill - a first for East Lothian, and a first for the East of Scotland. The ‘Petra RaceRunners’ or ‘Running Bike’ is a three wheeled cycle with no pedals which supports riders as they walk / run. They are designed for those who have disabilities which affect mobility, balance and coordination, such as Cerebral Palsy, Muscular Dystrophy, Multiple Sclerosis and Parkinsons Disease, but can be benefited by so many others. With a lightweight frame and very low rolling resistance, very little effort is required to propel the bike. 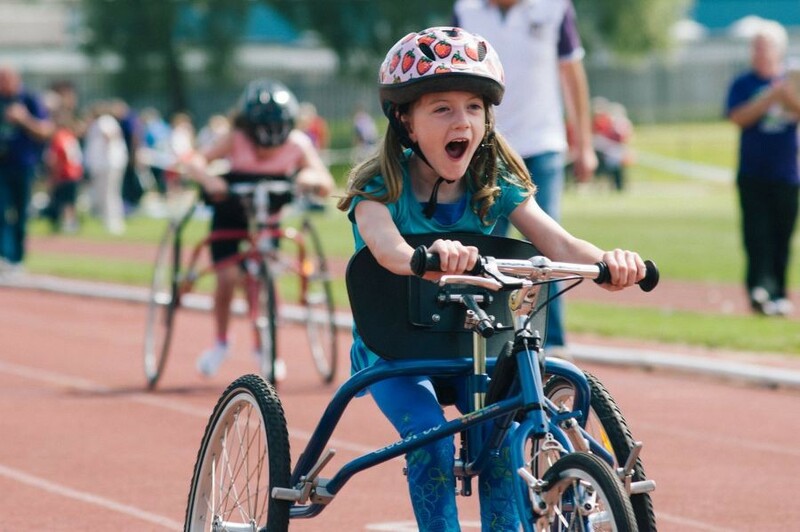 A total of 4 bikes, ranging in size suitable for 6-13 year olds, have been purchased for use by athletics disability club Lothian Leopards at their weekly training sessions on Thursday evening 6pm-7pm at Meadowmill Sports Centre. They will also be available to other users. Contact Meadowmill Sports Centre on 01875 619079 for more details. Funding for the bikes, costing a total of £6k was provided by enjoyleisure and a grant awarded to Lothian Leopards via the Bank of Scotland Community Fund. To officially welcome their arrival Lothian Leopards are holding an Open Day on Saturday 20th June at Meadowmill Sports Centre (athletics track), between 1pm -3pm. During the event, there will be an opportunity for young people to try the bikes for themselves, as well as a range of other athletics activities and learn more about what the club has to offer. Attending the event and showcasing the bikes capabilities will be 14 year old World RunningBike Champion Gavin Drysdale, from Ace RaceRunning Club in South Ayrshire. In 2014, Gavin represented Scotland at the International Wheelchairs & Amputee Sports Federation World Junior Games at Stoke Mandeville and returned with 4 Gold Medals. Lothian Leopards Open Day: 1pm – 3pm Saturday 20th June at Meadowmill Sports Centre.